My mother is in Rockport Senior Living memory care unit. There's a limit of nine residents at any time. There are always two full-time attendants, and they've been exceptional. I've got to know all of the attendants on the different shifts, and they've taken excellent care of my mom. They've got a sitting room with a TV and a computer. There's an outdoor courtyard off the memory care unit. Every now and then, two would go along and take the memory care residents on their bus to different places, to the Metro Park and things such as that. She has a private room. I'm always there every day with her at lunch and the food looks great, and she enjoys it. The facility is very nice. It's an old Sheraton Hotel. The memory care unit is at one extreme end, so every day I try to get my mom in a wheelchair and we go outside when weather permits, but if it doesn't, I walk her around the building and it's large enough that we can walk around for 5 to 10 minutes. They have trivia, crossword puzzles, arts and crafts, and trips away from the facility. Rockport Senior Living is a refurbished hotel. It's older, but the staff was very good. We saw a studio, which was small. They have a library, a chapel, and a large dining room. They allow pets there. They also have an atrium area for smokers. The facility was very nice. Rockport Senior Living was very nice, but the rooms were smaller. They were very pleasant and nice. Everybody was attentive, but people were kind of just sitting around down in the lobby. Rockport had an open but secured area where residents are able to enjoy being outdoors. They also offer memory care and a separate area for the patients. I appreciated that the interaction I saw with the residents and the staff was very involved, friendly and everyone knew their names. It was pleasant that they really get to know their residents. If your family member would like to try living there for a brief period of time, like a month, you can rent a room for the month to see what activities are available, get to know the staff and feel more comfortable transitioning to assisted living. My sister has been installed at Rockport. Her son thought this was best for her, and she's been there for a week now. The facility seemed all good to me. As soon as she got there, she was talking with people and enjoying it. We had meals and food is very good. My sister said if she is not careful, she is going to get fat. They have single, double, and suite rooms with furniture. It’s more than one story, and they have elevators. As we were walking around, we bumped into several people. It’s open and very nice. Rockport Senior Living was close to my sister. It was clean. Everybody seemed nice and friendly. The person showed us everything even when we didn't have an appointment and talked to us for a while. It was great. Rockport is very nice, and more for residents of lower-income. They were willing to work with you financially. The rooms weren’t as handicap accessible. They didn’t have the latest technology, and there’s a hallway where I can’t imagine how I will be able to turn the wheelchair. This facility was more bare bones. I visited Rockport Senior Living, and the person that showed us around was very nice and answered a lot of questions, but I would not consider having my mother go there. It was old, and everything needed to be redone. It didn't look like anywhere I would want to live. It just didn't have a cheerful atmosphere. The staff was very good and very helpful, though. This is the most family like environment I have ever felt while touring places for my mom. I'm an adult son and doing this on my own. It is very hard to know what to look for and I toured so many places. I happened to stop by Rockport and met with Amy, she was kind and caring and spent over 2 hours with me. I also had the pleasure of working with Caroline over the phone, she too was patient and kind and helped me! I didn't want to have to move my mom anywhere, but I am so grateful I stumbled upon Rockport! Every staff member other then 1 has gone above and beyond! The food is just like having home cooked every night. The activities are fun and I enjoy coming to catch the tail end of them! Mom is stimulated and happy, so I am able to relax and be happy myself! With much appreciation. Thank you so much for the kind words! We work very hard to go above and beyond for our residents. They are so important to us and the reason we do what we do. Thank you for taking the time to let us know how we are doing! I have a family member that I could no longer leave at home, while I work my part time job. I found this facility and found that they offer adult daycare. I came and visited and was so pleased with what I say. The patients that attend are engaged, having fun and laughing. It took me awhile to convince my Mother to attend but now that she has been going for approx 3 months, she loves it and I have noticed a change in her for the better! She is sleeping through the night now on the days she attends "camp". Thank you for having this program. We thought Rockport was a fitting place for our brother. My brother was not interested in a spacious room. He wanted a studio. We were delighted with what we have seen so far. Rockport Senior Living Rocky River's rooms were kind of old and drabby. I saw some people sitting around and that's it, so we weren't very impressed. The dining room was OK but nothing outstanding. Most of what we saw was kind of old and shabby. The only thing I didn't like about it was that it was on a busy main road, and they didn't have nice grounds where you could walk or ride a bike. It was a congested area. They had a little screened area, but it's not much. Everyone was very nice. There wasn't much to the facilities. The building was clean but old and needed some updates. I toured the independent living of Rockport. The food was good, and the rooms were clean. It was an older property but well-maintained. The residents seemed pleased to be there. It was a nice, friendly atmosphere. It's in the suburb, but near where the businesses are, and there weren't a lot of grounds. Very good service provided to the community. Family member took part in it for some time. Staff were attentive and good. Food was more than they needed. People were nice with good activities. My husband was going to Rockport for daycare (Rockport Elderly Care) three days a week. I really like their care with the daycare. They went above and beyond with my husband. He was having problems with his income but they still kept him, which they didn't have to. I love those people there. They were so, so good to my husband. They were very good. This is a great program. I can not tell you how well they do with my mom. She was very isolated before attending daycare, now she is flourishing not only at daycare but at home. The staff is superb! Describe the overall population of assisted living residents at Rockport Senior Living. What is their average age? What are their favorite things to do? What places are near Rockport Senior Living or within walking distance for assisted living residents to enjoy? What makes the chef or dining program at Rockport Senior Living exceptional? What kind of menu can assisted living residents expect? What safety features or security measures does Rockport Senior Living offer to assisted living residents? 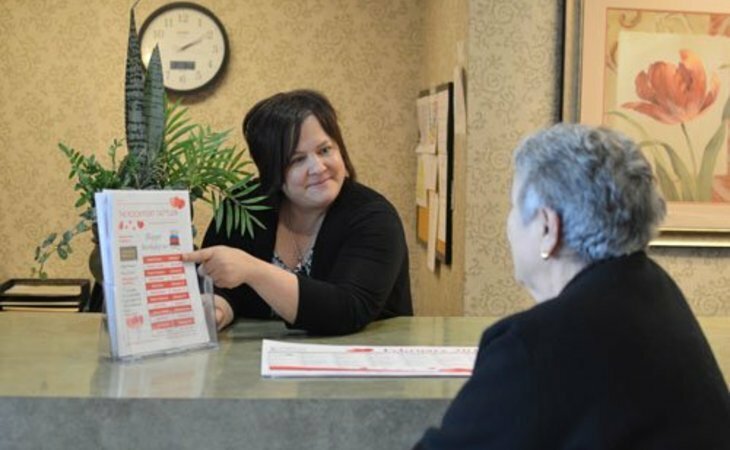 How does Rockport Senior Living keep residents' families informed about their loved ones? Rockport Senior Living is one of the most affordable, social communities in Rocky River, Ohio. We are privately owned by a local, caring family and have had the same core staff since our doors opened in 1995. We invite you to come visit us today and find out why more Westshore area seniors call Rockport home! Rockport has a history within the community and offers its residents a unique building in a great city. We offer a variety of private and spacious apartment suites to choose from, and an array of services to give our residents a comfortable, carefree lifestyle. What should caregivers and potential residents know about Rockport Senior Living?